Without a doubt, this has been my favourite week of the season so far (and it’s gonna be difficult to top). Although not every episode has been a 10/10, those that did succeed have made up for the slack a hundred times over. Not only did some of these episodes bring me to tears – even after a second viewing – but there was an incredible amount of humour brought to this week. As much as I wanted to load this post with animated GIFs and screenshot collections, I reigned myself in and did my best to keep a calm and collected head. Except for New Game!! where it basically became an “I adore Hifumi rant”, but I suppose you’re all used to it by now. I’ve been enjoying this show immensely so far and this week brought one of the most entertaining twelve minutes ever. With the first section focused on a cinema setting, a lot of this episode acted as an excuse to vary the style of comedy. Funnily enough, this isn’t the only episode this week to use this setting with New Game!! also focused on an anime experience. The rest of the episode basically functioned as a setup for next week’s obvious beach episode – picking out swimsuits and preparing for their trip. One of my highlights this week is seeing Yoshiko’s Mom who we haven’t seen in a long time. Providing a new blend of insanity and power to the group, her interactions with the Student Counsil President had me in stitches. 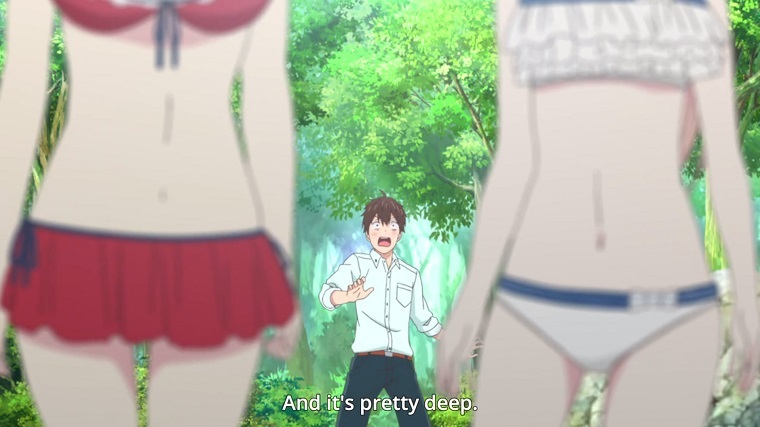 As always, AHO-Girl is one of the funniest shows this season and possibly the craziest show of such a short episode length. With such a disgusting episode last week, it’s pretty difficult for this show to top itself in terms of the lasting effect on its viewers. With the exception of a few satisfying moments where Saotome has got her inspiration back, this episode was relatively lacklustre. Formulaic might be a bit harsh but this week definitely felt more generic than what we’ve come to expect from this show. Even in terms of the overall narrative, the results of this episode aren’t that impactful at all. The whole thing felt like fanservice in the form of our two protagonists finally working together despite their differences and conflicts of the first few episodes. A large feature of this episode’s weakness is the antagonist, the person the two are gambling against is just a brute who looks down on livestock. When this show boasts such an eccentric cast in its opening, it’s disappointing to have, not one, but two episodes focused on this boring guy. Bit of a shaky episode but did well to set up for some actually engaging scenarios next week. In a show where battle sequences reign supreme, an episode that is 90% battles is exactly what audiences want. This week didn’t disappoint, as the show’s most cinematic action scenes take precedence over the show’s otherwise tiresome narrative. Following the cliffhanger of last week, the underground bad guys that we’ve seen every now and then have finally attacked. Using a stolen silhouette knight as a Trojan Horse, the gang manage to hijack a number of the stored mechs that Erneste helped develop. With the numbers large on both parties, this episode really went havoc on the action with fight sequences all going on one after the other for an undeniably amazing episode. With my current favourite moment of the show being these new knights working together, this episode was only let down by its last five or so minutes. Having clearly focused on these mech vs mech fights, when a pack of Demon Beasts emerge from the shadows the quality drops substantially. Instead of the fluid animated sequences, we’re shown a series of still images functioning as a kind of “look, they fought them” which felt cheap after such an amazing scene. Overall this is my favourite episode of the series so far and bodes well for the future. There’s only so many ways I can say “the drama is increasing” without it sounding redundant but that’s really all that has happened in the last three weeks now. This week focused heavily on character development by having all four members of the love “triangle” spend some quality time together in the forest. While in certain aspects of the word, there was some quality bonding time, not much in the grand scheme of things happened with the exception of Ririna realising something audiences have known for two weeks now. As expected, the fan service came in troves this week in more ways than one topped off by the generic fireflies in the forest sequence we’ve seen many times before. For some reason this episode just didn’t feel worthwhile. Critically speaking it was visually comprehensive and the dialogue is as textbook as it’s always been. Maybe being spoon fed a series of generic ideas has gotten tiresome in its fifth week. Hopefully next episode will prove me wrong but I really didn’t have much good to say about this week. We’re finally at the point where humans aren’t the biggest threat to our two protagonists. Already we’ve seen a collection of eccentrically designed monsters and this episode is no different, displaying a play on the “mimic” style of predator. In addition, this week’s soundtrack was especially awe-inspiring – adding to the whole feel of this episode of new adventures. I’m no music major, but there’s one recurring theme that plays through all of the exposition and dialogue heavy sequences that really emphasises a journey into the unknown. With the Opening and Ending songs being so lighthearted and stylised as children’s songs, it’s interesting to have such a foreboding and in-depth soundtrack to further exaggerate the true danger in the second layer alone. Visually, this episode was as stunning as usual, one sequence in particular showing off the incredible talent in effects animation and explosions that put Konosuba to shame. Overall a really solid episode, not quite reaching the level of amazement I personally felt since episode three but a great one nonetheless. As a viewer who adores Hifumi more than anything in this world, obviously my viewpoint on this episode is going to be somewhat skewed. That being said, I’ve had nothing but praise for this show so far anyway so what’s new? Following such an introspective and thought provoking episode last week, (so much so that I made an entire video dissecting the episode you can check out here), we’re brought back to the heart warming sequences and screenshot worthy reaction images. That’s not to say this episode was without its fair share of character development. As we’ve seen Hifumi slowing improving her ability to socialise under pressure, it was inevitable that some sort of reward would come as a result of such hard work. With Yagami Ko working as Art Director and Team Leader, Hifumi’s recent achievements have allowed her to step up and become the new Leader of the Character Team! 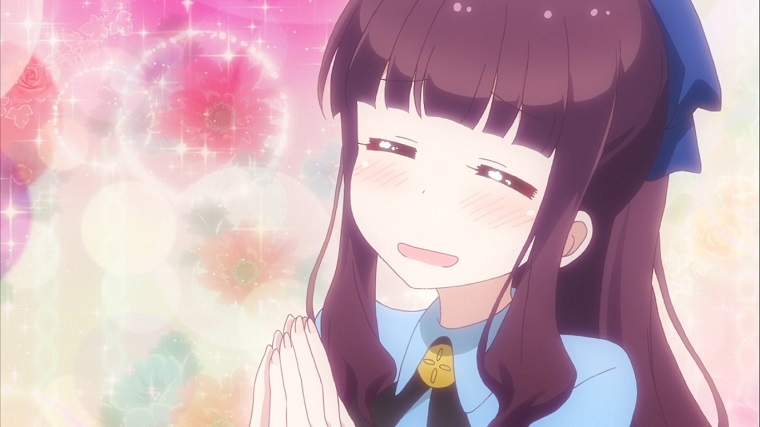 Although this may seem like an obvious move considering she’s been creating the main character models for pretty much the entire show, the honest writing and touching soundtrack make this promotion so important to the development of Hifumi’s character. As much as I want to say this is my highlight of the week, I haven’t talked to you about Welcome to the Ballroom yet. So far in this season, choosing a highlight has been a difficult task with a number of runner ups. This week, there are no runner ups, no close seconds. This episode was flawless in every sense of the word. Critics tend to exaggerate when describing something they personally enjoyed but after my third viewing of this episode I can confidently say that this is the most impressed I have ever been in all my time watching anime. There is so much to this episode that it warrants its own article entirely but I’ll do my best to sum up my thoughts here. In the space of one episode they managed to make this new character Mako more likeable and relatable than any other character in the last four episodes. Not only were the visuals absolutely stunning (even more so than the previous weeks) but the narrative confined in this episode was perfect. As a writer, this is how I envision a perfectly written story to be. Providing a hefty amount of characterisation while developing the overarching plot-line while also setting up a collection of maddeningly complex questions that the audience have no hope of solving themselves. 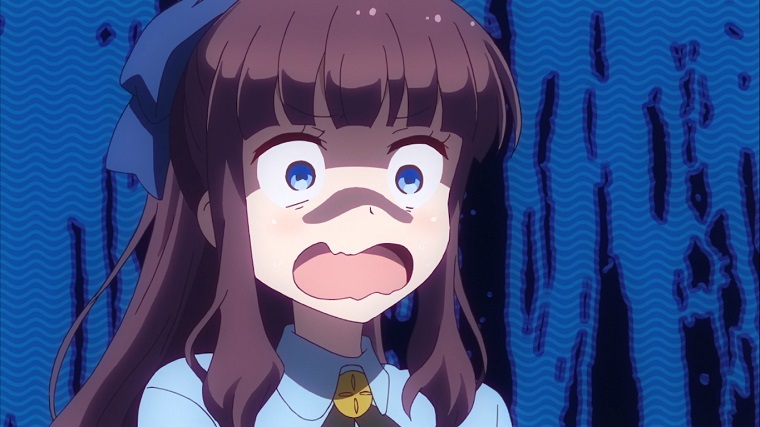 Every single scene in this episode felt polished and integral to the plot, from the fine details of how Sengoku-san reacts to this new potential partnership to the complete effortless connection between Mako and Tatara. As always the soundtrack is magnificent, only heightening the already breathtaking emotional sequences and never dipping throughout the episode. I honestly have no complaints for this episode, no matter how hard I tried to find them. As a critic, episodes like this somewhat irritate me as there is nothing negative to say about it. It is so very rare that I have so much praise for a single episode, which only goes to show how high I place this episode. Episode Five is the most impressive piece of content I’ve seen in a very long time and I implore every single reader to watch this show purely to experience this episode.